Learn all you need to know about the new Lufft WS100 precipitation sensor in webinar on November 29, 2017. You are invited to our webinar about the Lufft WS100 radar precipitation sensor. Here you will learn everything important about the measurement technology, installation, calibration, fields of application, product benefits as well as its differentiation from other technologies. The Lufft WS100 is a maintenance-free radar precipitation sensor for meteorological monitoring. The only one of its kind – it recognizes the type and amount of precipitation from the first drop, and is preferred for remote locations. The WS100 helps to make important operational decisions within a few seconds. Due to the modern radar technology, the sensor detects precipitation from the first drop. It measures not only the quantity, but also the type of precipitation. 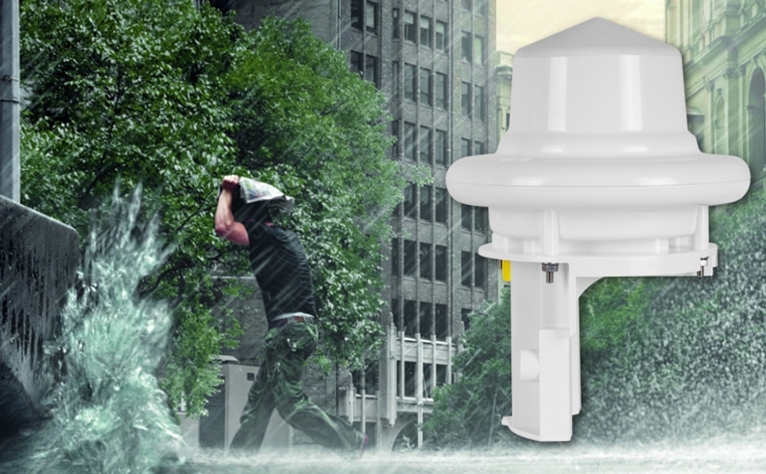 The sensor also detects the drop size and divides it into one of the eleven different rainfall classes. Maintenance-free operation through ingenious technology without any moving parts. This distinguishes the sensor significantly from other methods for measuring precipitation such as the tipping bucket, the weighing principle or the optical method. The WS100, with unprecedented speed, precisely measures precipitation from the first drop. It measures the precipitation intensity up to 200 mm per hour and detects drops with a size of up to 5.0 mm. Using a 24-GHz Doppler radar, it measures the speed of all forms of condensed water that can be observed on the Earth’s surface or in the atmosphere. These include rain, freezing rain, hail, snow and sleet. The University of Albany, in partnership with the State of New York, are in the process of constructing the New York State Mesonet, a highly advanced network of weather systems designed to provide real-time weather data and warning systems to citizens of New York in the event of severe weather. The State of New York has had several extreme weather events in recent years, mainly Hurricanes Sandy and Irene, and the Mesonet System will provide improved forecasting and warning systems for future weather events. There are currently 125 weather stations in the Mesonet network across the state, and many have been equipped with the OTT Pluvio² Weighing Precipitation Gauge for extremely high accuracy precipitation measurement. Check out the video below for an overview of the NYS Mesonet and to see the OTT Pluvio² in action! At OTT Hydromet, we know a “normal day in the office” for our customers can involve some pretty amazing adventures! It’s no exception for an OTT Pluvio² customer performing routine maintenance high up in the Swiss Alps. Watch the amazing video below!